Although our dinner at the Solitaire guest lodge wasn't all that great on our first night, we were pleasantly surprised on our second night, when a very good and very diverse buffet was laid out before us, albeit at a price. 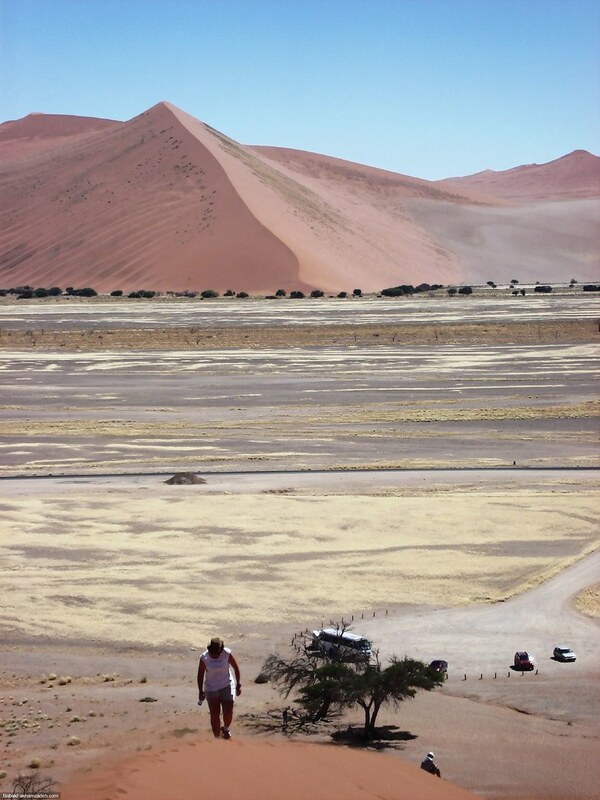 Then again, considering that literally everything has to be transported over vast distances to get here, it wasn't all too bad. 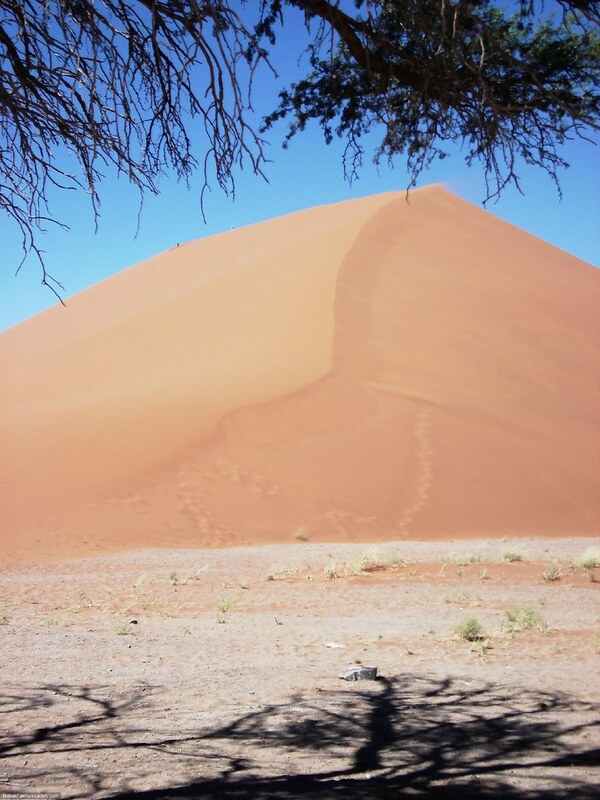 Also, we really needed a good dinner, as we'd been out all day visiting the world famous Sossusvlei and several of the surrounding valleys. 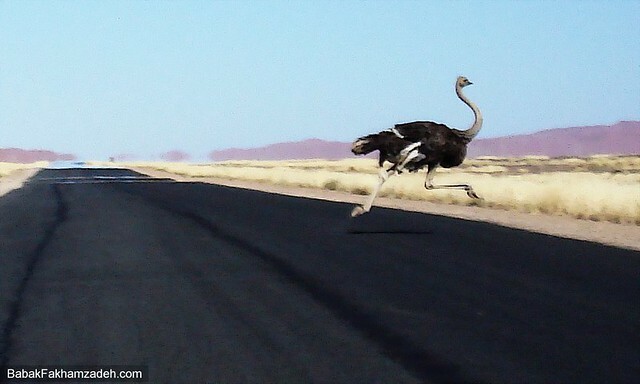 Shortly after leaving the lodge in the morning, we were alerted to a rattling sound coming from the right back tyre. 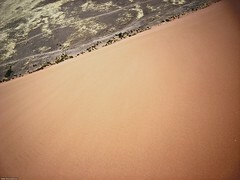 Although we discovered that this one, too, was nearly flat, topping it up with air didn't stop the rattling. 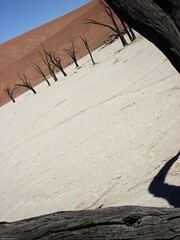 We crossed our fingers and, eventually, made it through the day. 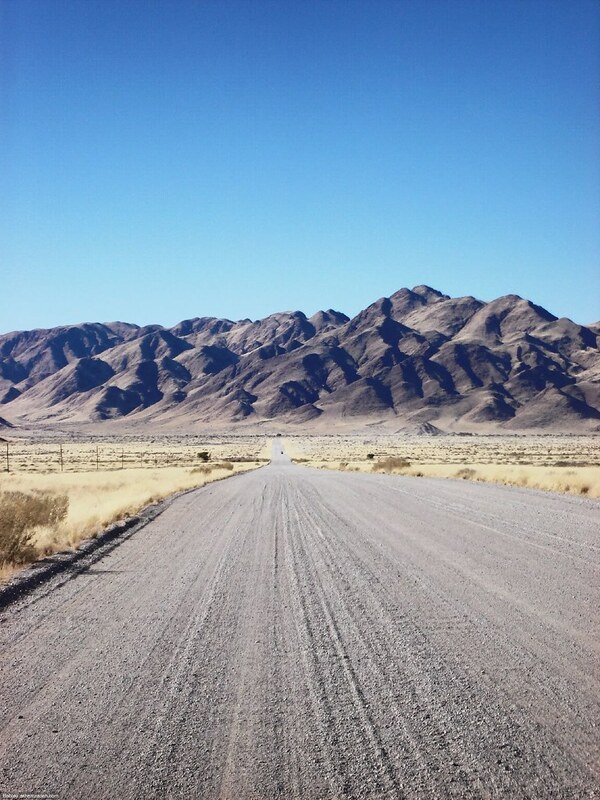 It's only some 200 kilometres to Walvis Bay, after which it will be tarred roads all the way back to Windhoek. 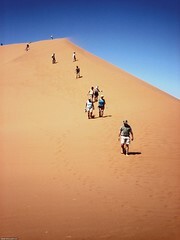 More than one in two tourists, so it seems, here in Namibia, is German, but when we tried to scramble up Dune 45, the most accessible of the red Namibian dunes, 45 kilometres from Sesriem, the entrance to the national park which will lead you to Sossusvlei, a whole tour bus of Dutchies was unloaded and all of them started to climb up the sandy hill. 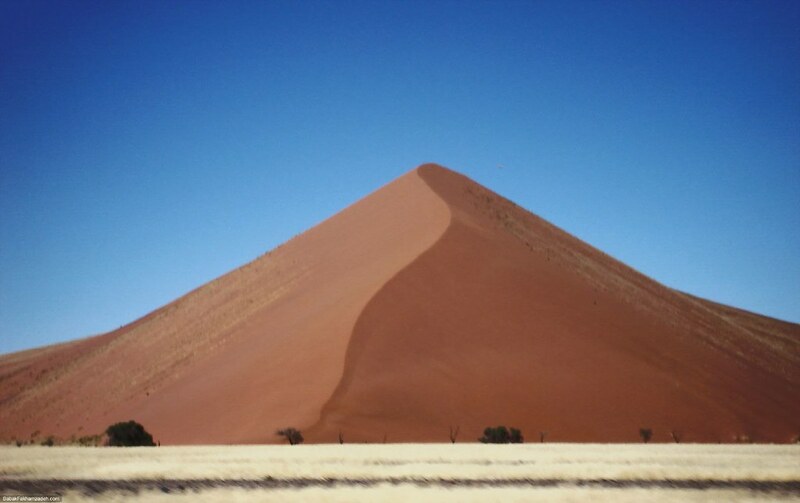 I had planned to reach the top but when I arrived at what I thought was the summit, I noticed a much higher top in the distance, part of the same dune. 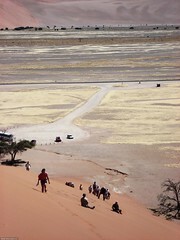 Climbing up the steep sandy slopes is extremely tough, and I gave up. 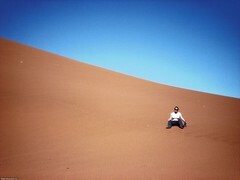 Having gone up without shoes, I was first afraid the sand would be too hot on my feet, but was positively surprised when this was not the case. 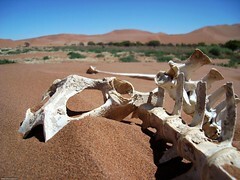 Until later. When I went down, the sand was actually so hot, I ended up with blisters on two of my toes before discovering the trick: With your feet slightly below the surface, more or less up to your ankles in the sand, slide down, as if you're ice skating. 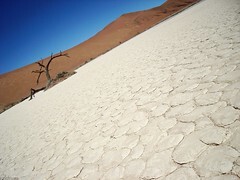 The Sossusvlei I found the least impressive of the three valleys we visited, even though there was a small salty lake, where mostly the valley is as dry as the desert surrounding it. 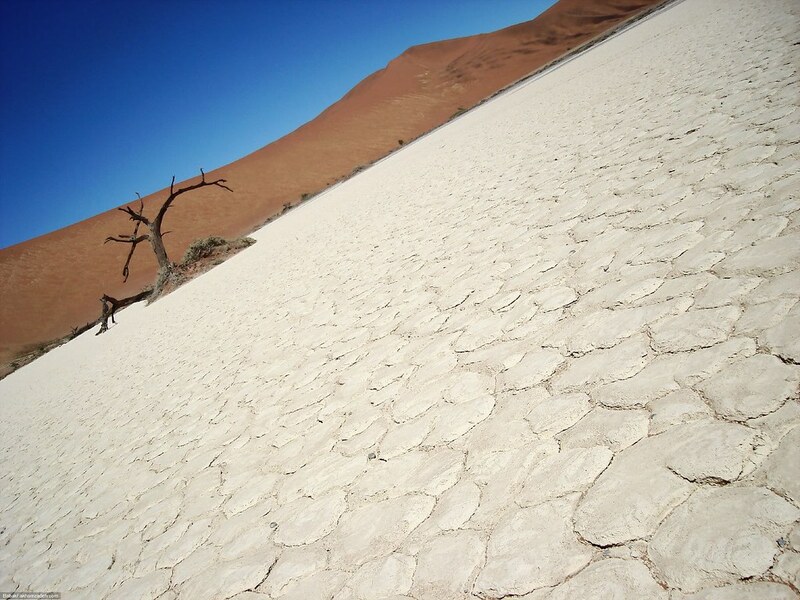 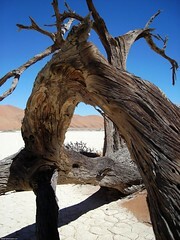 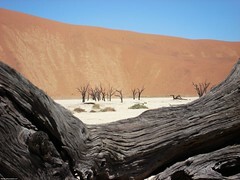 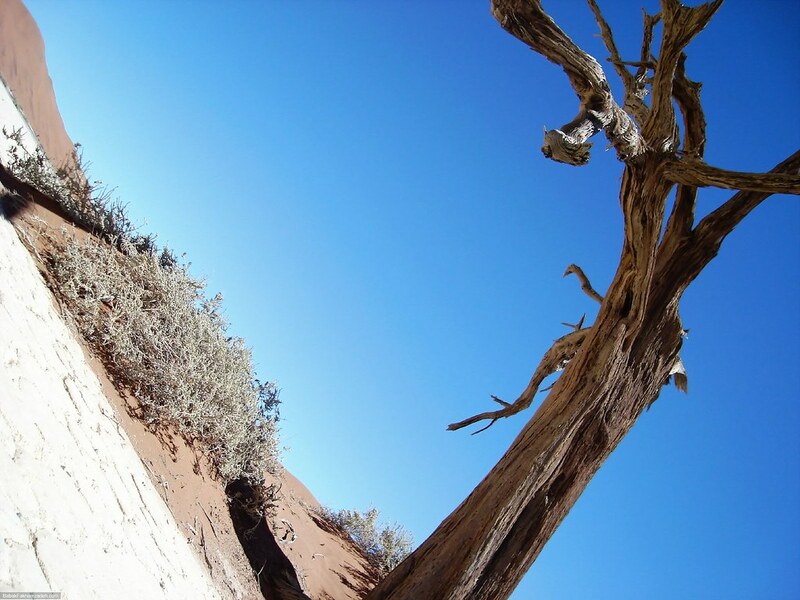 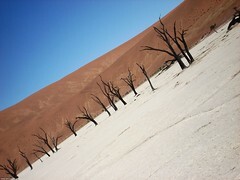 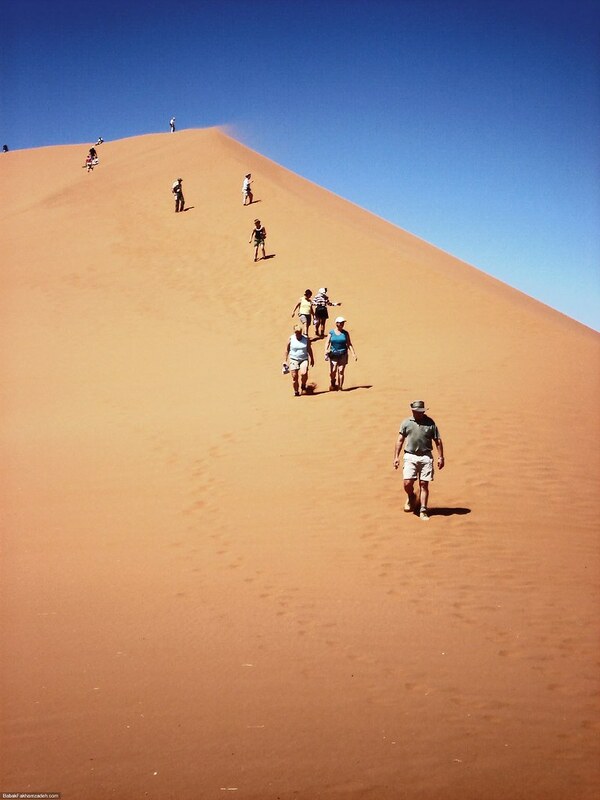 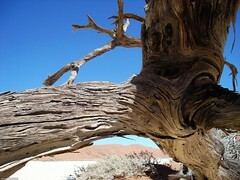 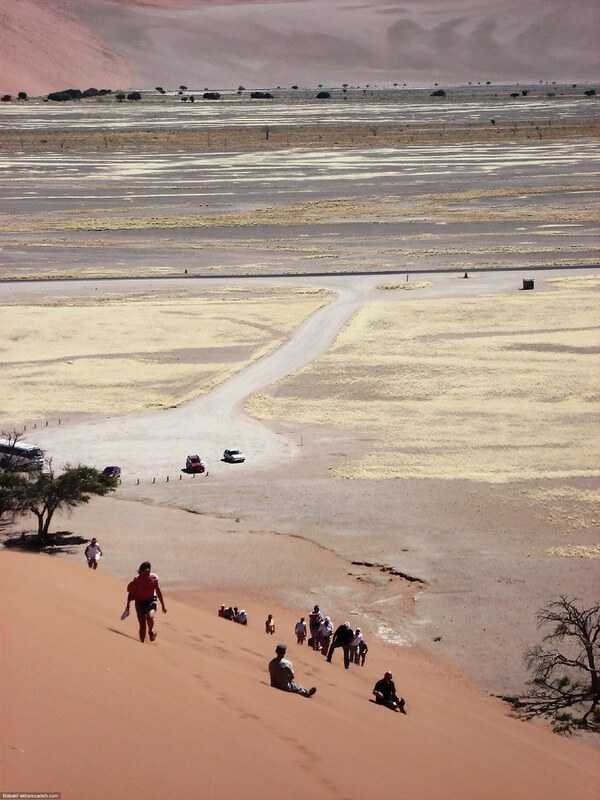 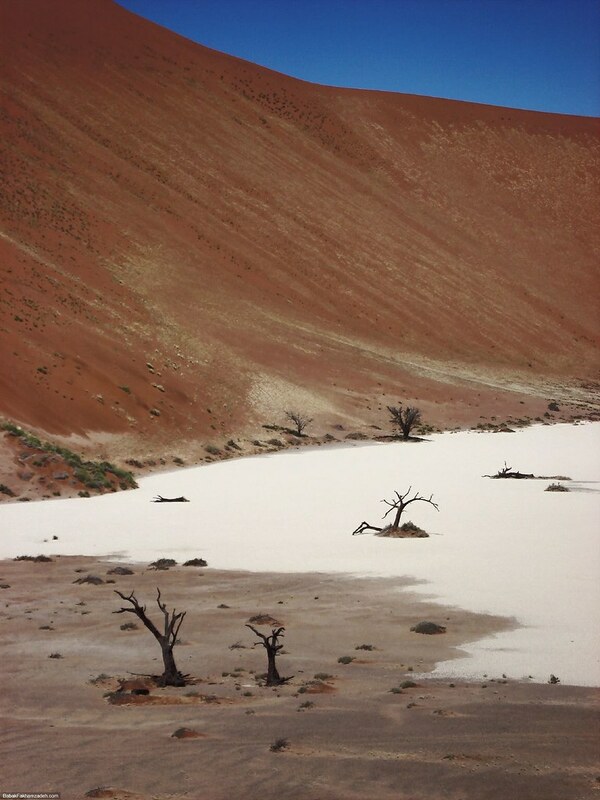 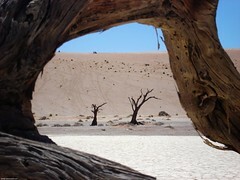 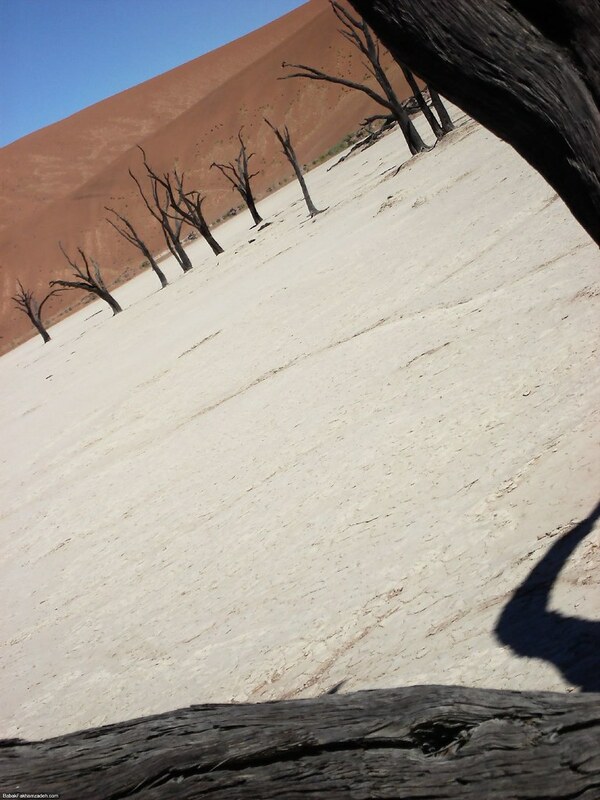 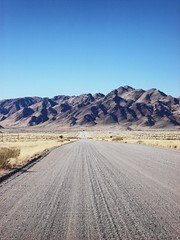 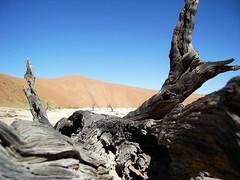 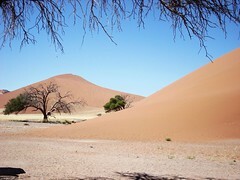 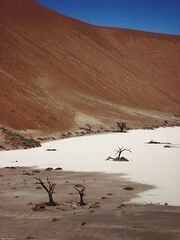 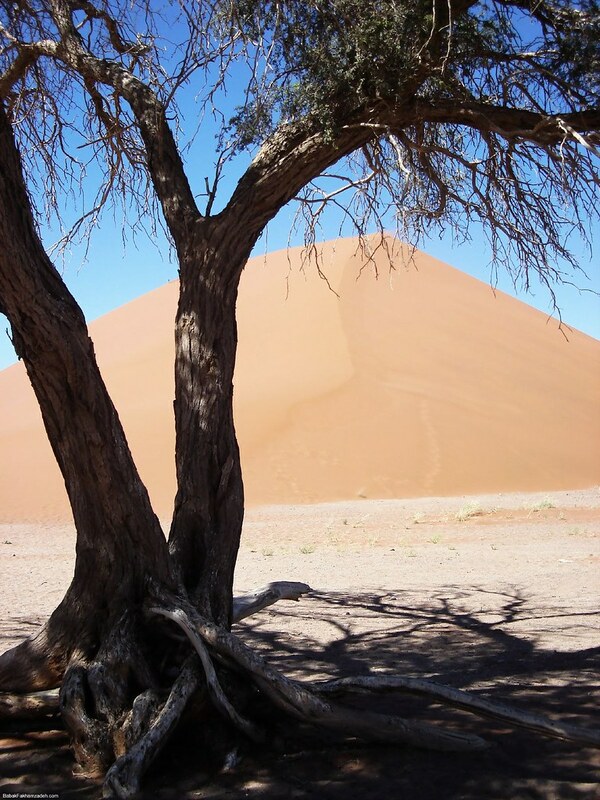 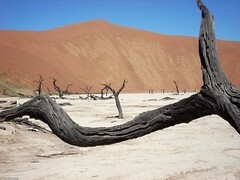 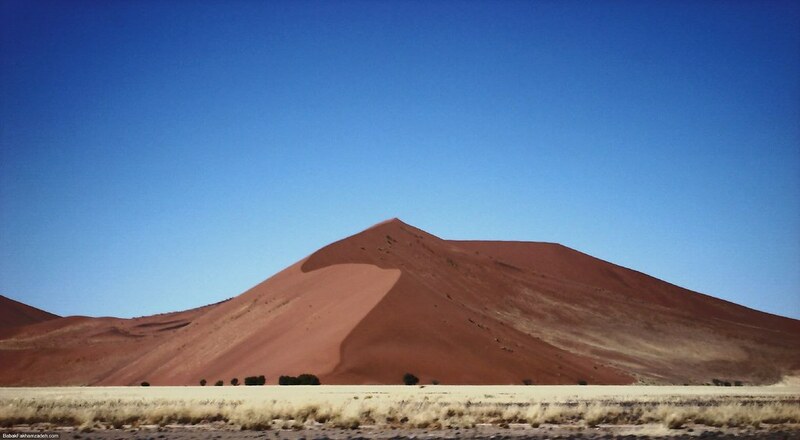 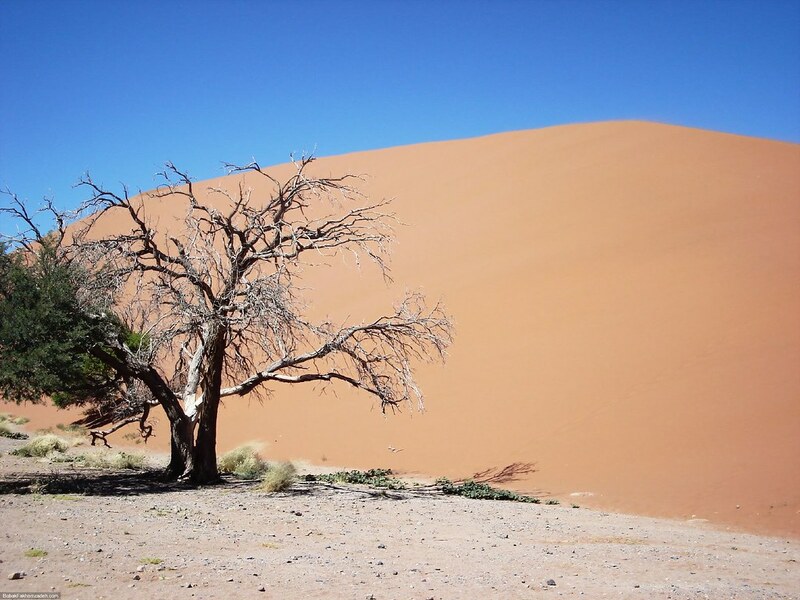 Sossusvlei, where you can drive to by 4×4, is also the most accessible. 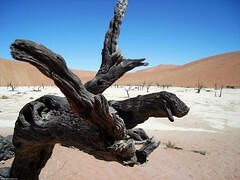 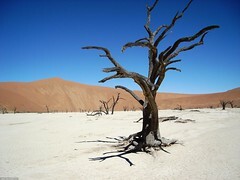 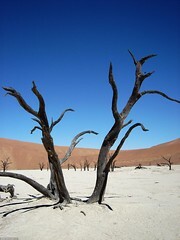 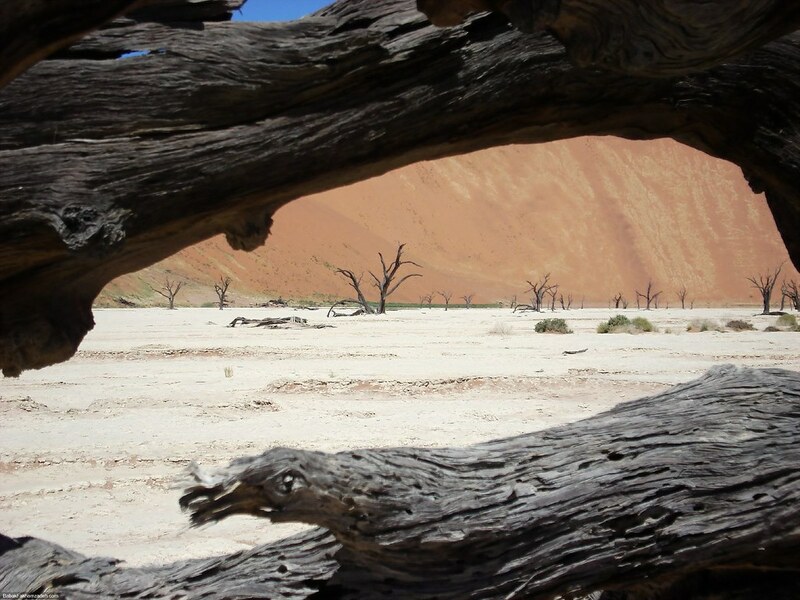 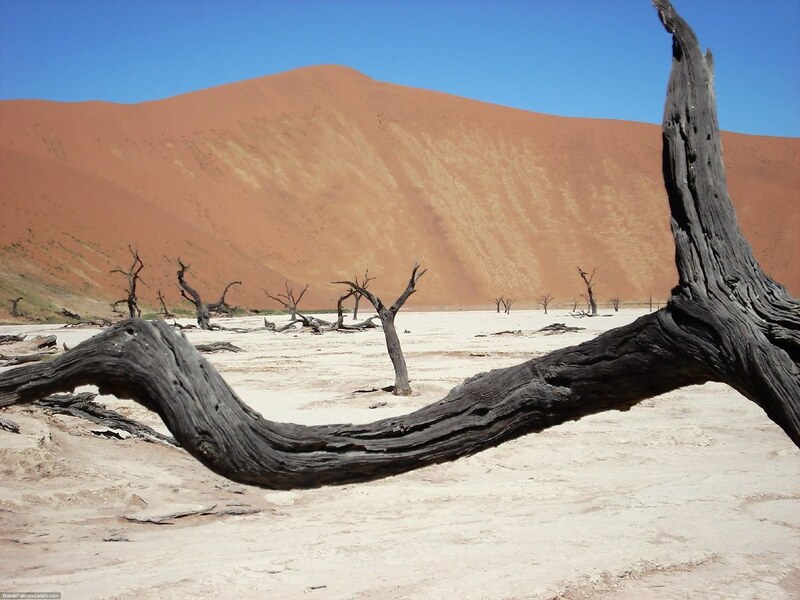 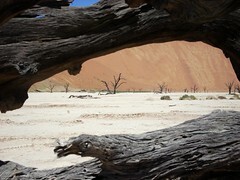 The two other valleys we visited, Dead Vlei and Hidden Vlei, I found more impressive, particularly Dead Vlei, with its many 500 year old dead trees sticking out of the ground and the extremely parched earth. 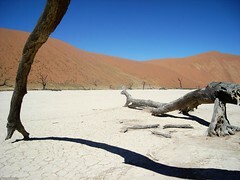 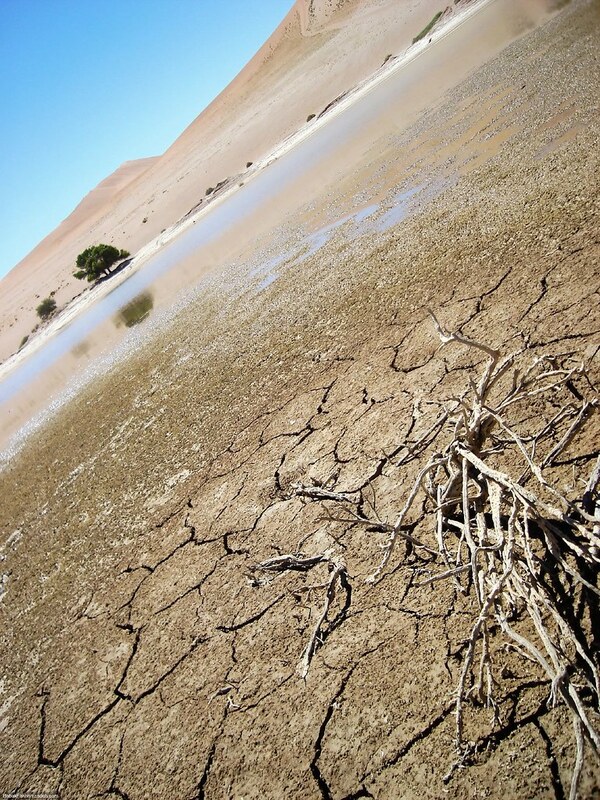 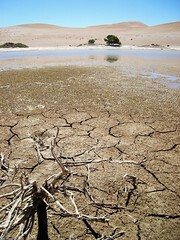 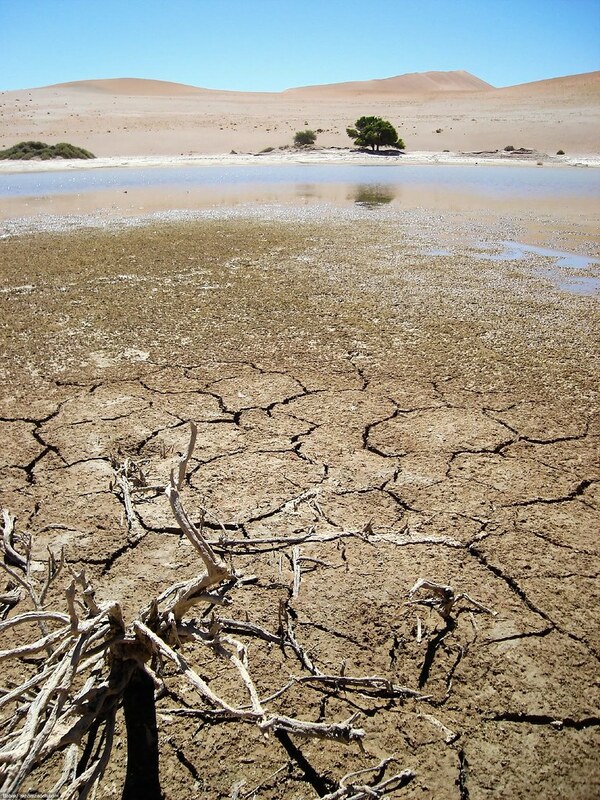 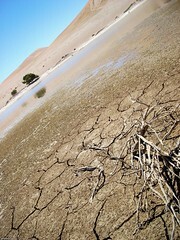 Confusing was the salty smell as we approached the small lake in Sossusvlei. 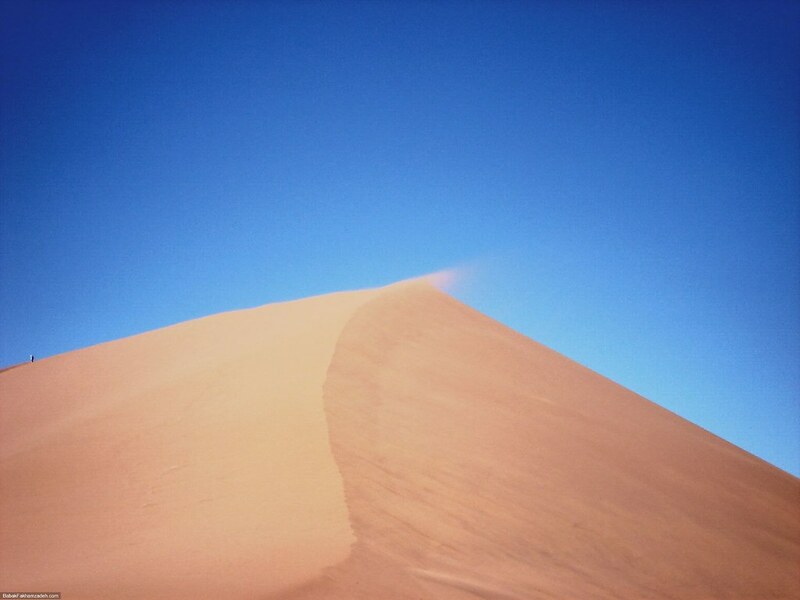 With your eyes closed, you'd be mistaken it for a nearby sea. 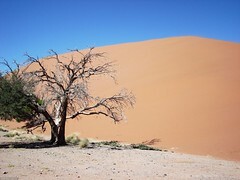 And it's hot. 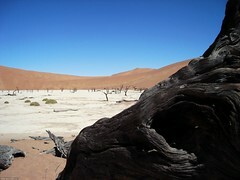 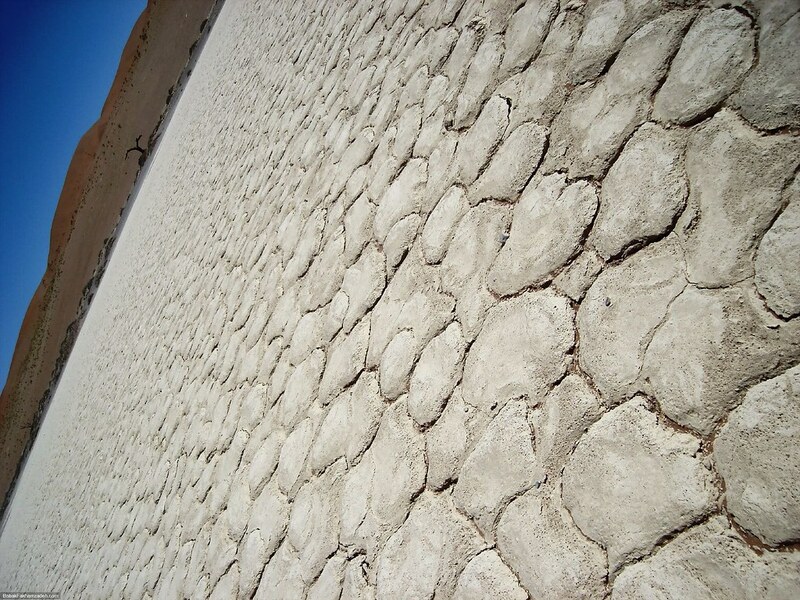 According to the Lonely Planet, surface temperatures can go as high as 70 degrees centigrade. 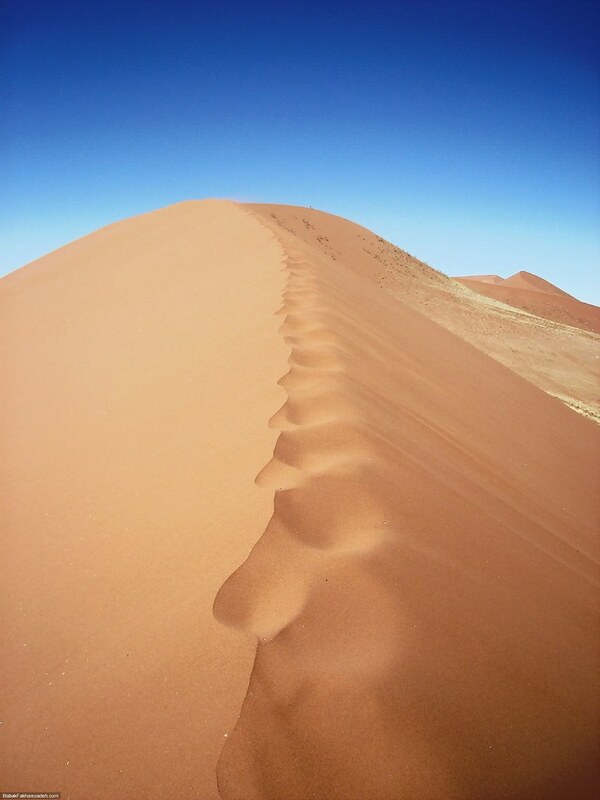 Earlier on, my feet seemed to confirm this. 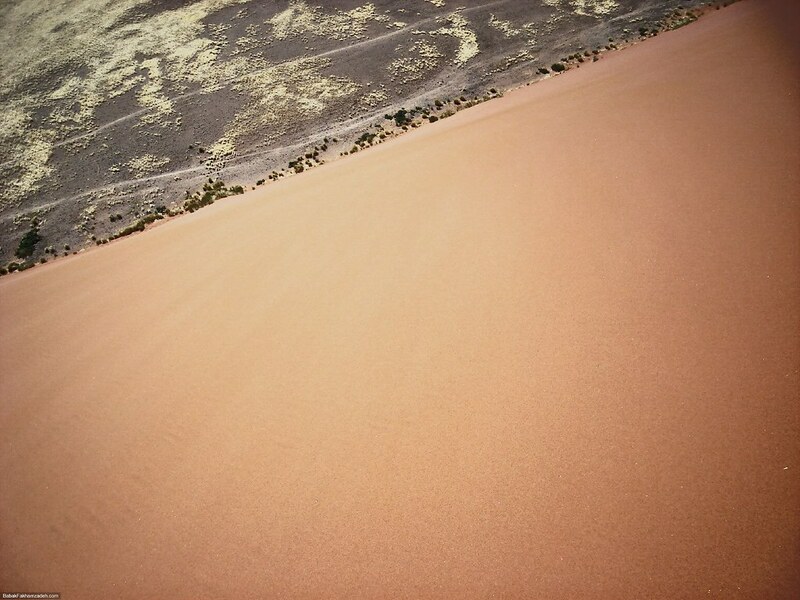 We're almost inside the Tropic of Capricorn, meaning that the sun, at some day during the year (almost) stands right above the earth ,creating only a shadow beneath your feet. 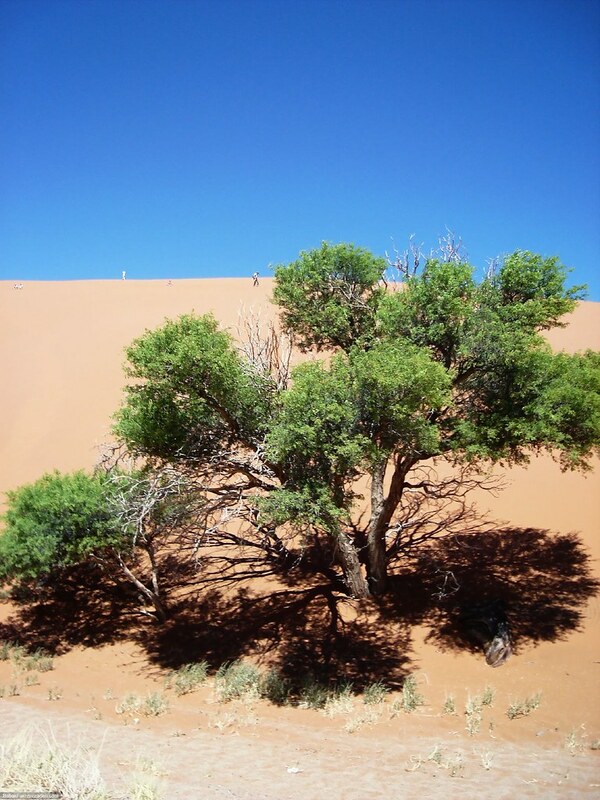 We're still some two months away from the longest day, but already the sun was beating, beating, beating down on our heads. 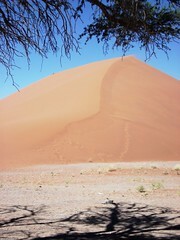 I was very happy that for the last five kilometres to Sossusvlei, which is only accessible by 4×4, a shuttle is available. I had wanted to walk the distance, but the sun was just too much.